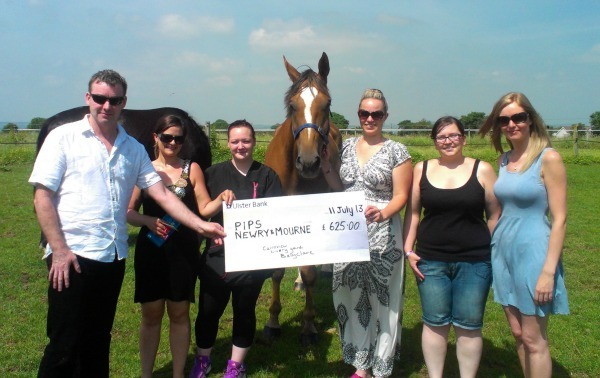 Pictured at Cairnview Livery Yard near Ballyclare are Eamon Murphy (PIPS Newry & Mourne) receiving a cheque from Talitha Collins, Stephanie Watson, Nikita Cochrane, Katie McClay, Lynsey Wilson and Shelly Boyle. The girls raised this money (£625.00) through participating in the Belfast Marathon Fun Run 2013. They focussed on this challenge following the loss of their good friend Eimear in February of 2013 . Eimear orginated from Newcastle in Co.Down and this was why the girls chose the charity PIPS Newry & Mourne. PIPS Newry & Mourne extend gratitude and thanks to the girls on they're efforts to give hope to other individuals through their kind donation.